Manufacturer & Exporter of Digital Clocks. Our product range also comprises of LED Video Display, LCD Video Wall and LED Display. We offer these clocks in various designs at reasonable rates. We are dedicatedly engaged in offering superior quality Digital Clocks for Office. This timepiece is not just functional but the elegance, fun and fashion incorporated makes it a unique showpiece. Latest technology and high quality components are brought into use for manufacturing the offered range of clocks. We offer these clocks in various designs at reasonable rates. 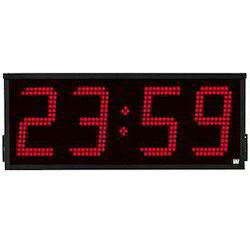 Looking for Digital Clocks ?